According to Adrian Wojnarowski, the injury to the oblique muscle (lateral part of the abdomen) can be low for about a month. Bad news for the Boston Celtics. The Massachusetts team will not be able to count on Marcus Smart for the first round of the playoffs almost certainly, and it is likely that a semifinal match will also be lost if his team eliminates the Pacers. This has been confirmed by sources from the League to Adrian Wojnarowski, who explained that the injury was produced in the oblique muscle of the left side of the abdomen. The action was last Sunday in the game at home against the Magic, when he fought for space in the area against Vucevic, with which he crashed. 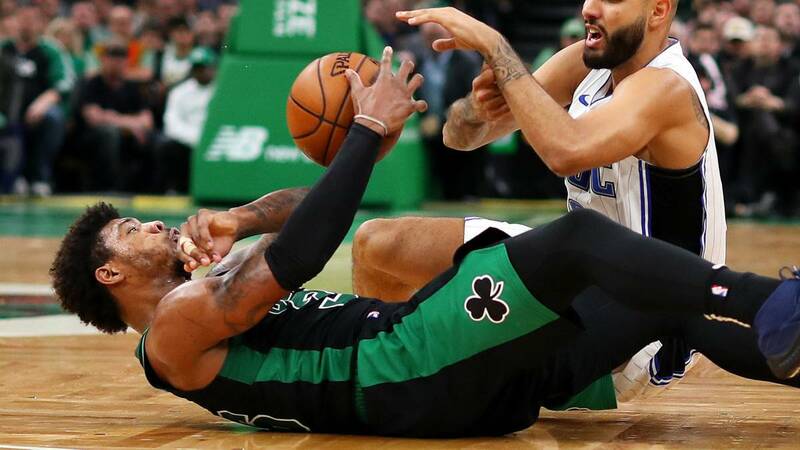 The hip of the pivot hit in the lateral zone of the trunk of the one of the Celtics, that immediately remained thrown in the ground with great pain samples. He tried to play again, but in the next action he lay down again and they had to help him get out of the track. The downing of Smart can be lethal for the Celtics. The player, who has averaged 8.9 points, 4 rebounds, 42.2% in field goals and 36.4% in triples, is the team's greatest defensive specialist and one of the best outside defenders in the League. If they reached seven matches in the first round against the Pacers the tie would end on Sunday April 28, date that now seems too early for the guard to play again. Other that may not start the playoffs is Joel Embiid, although in this case the low would be much shorter. It was the general manager of the Sixers, Elton Brand, who confirmed to the press that the center could miss the first game of his team against the Nets, next Saturday at 20: 30, Spanish time (is the game that opens the playoffs this year) . The problem would be in his knee, which is usual to give him a break from time to time. In fact, Embiid has missed five of the last seven regular league games of the Sixers. Not because he had any particular injury, but as a precaution. The same thing can happen this Saturday, although the drop is not expected to extend beyond there.